Ali, one of the few survivors of a mass execution at the Presidential Palace in Tikrit, is visible among more than 60 captives prior to execution in a still frame from a YouTube video posted by Islamic State. (Erbil) – New evidence about executions carried out by the Islamic State (IS) in Tikrit after it seized the city in June 2014 triples the estimated death toll and shows additional execution sites, Human Rights Watch said today. Information from a survivor and analysis of videos and satellite imagery has confirmed the existence of three more mass execution sites, bringing the total to five, and the number of dead to between 560 and 770 men, all or most of them apparently captured Iraqi army soldiers. Islamic State fighters, formerly known as the Islamic State of Iraq and Sham (ISIS), killed between 160 and 190 men at the two execution sites that Human Rights Watch previously identified. The total is likely to climb further still as more evidence emerges, Human Rights Watch said. Islamic State fighters took control of Tikrit on June 11. The next day it claimed to have executed 1,700 “Shi’a members of the army,” posting videos of hundreds of captured men in civilian clothes, who it claimed had surrendered at the nearby Iraqi Speicher military base. Photos later posted on social media showed IS fighters loading captives in civilian clothes onto trucks and forcing them to lie in three shallow trenches with their hands bound. Some images showed masked gunmen firing weapons at these men. Based on an analysis of satellite imagery and photographs available at the time, Human Rights Watch concluded on June 27 that two of the trenches were in a field about 100 meters north of the Water Palace in Tikrit. The location of the third trench was not identified. After analyzing a recently released Islamic State video of the execution of detainees and satellite imagery, Human Rights Watch has identified three new execution sites from that period, with an additional death toll of between 285 and 440. The locations of two of the sites have been precisely identified based on the imagery and witness evidence, while the location of the third site remains approximate based on the account of a survivor. 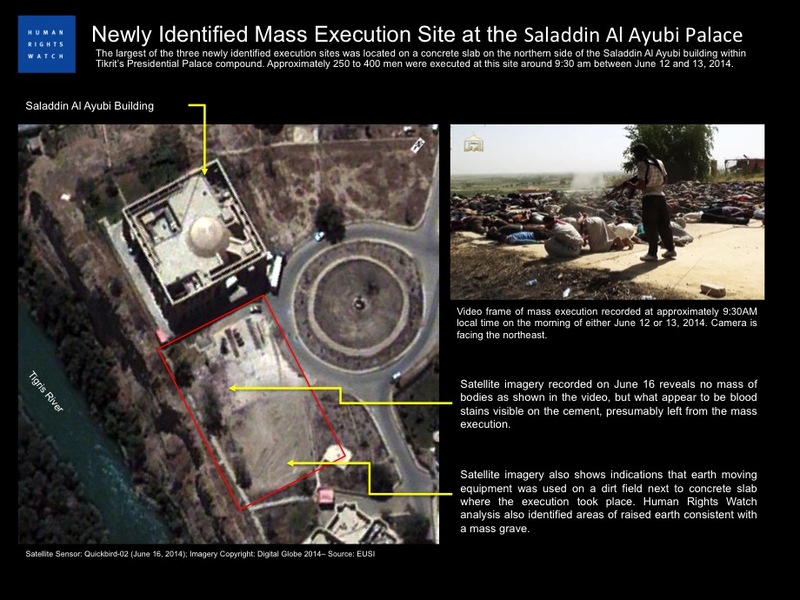 The largest of the three newly identified execution sites is a concrete slab on the north side of the Saladdin Al Ayubi building, within Tikrit’s presidential palace compound. Video images, cross referenced with satellite imagery, indicate that approximately 250 to 400 men were executed at this site at approximately 9:30 a.m. on either June 12 or 13. Satellite imagery recorded on June 16 reveals no mass of bodies as shown in the video, but what appear to be blood stains, presumably left from the mass execution, are visible on the concrete. Satellite imagery also shows signs that earth-moving equipment was used on a dirt field next to the concrete slab. Human Rights Watch analysis also identified areas of raised earth consistent with a mass grave. Satellite image recorded on June 16, 2014 shows what appear to be blood stains visible on the cement where the mass execution presumably took place, and indications that earth moving equipment was used on the adjacent dirt field as well as areas of raised earth consistent with a mass grave. The second newly identified execution site was at the Water Police building next to the Route 24 bridge. Video footage of the executions showed Islamic State fighters using pistols to execute at least 25 to 30 men between 6:30 and 7 p.m. on June 12 at this site, then dumping their bodies in the Tigris River. The full number of victims at this site may be higher. Ali, a 23-year-old survivor of one of the shootings, told Human Rights Watch that he was captured on June 12 with thousands of other men as they sought to flee along the main road from Spiecher military base. Other soldiers and officers had advised him to wear civilian clothes to try to avoid detection by Islamic State fighters. Video footage released by the Islamic State supports the statements of witnesses that thousands of captured men were marched into Tikrit, escorted by IS fighters. Ali, who said he was at the front of the procession, told Human Rights Watch that a group of about 100 IS fighters stopped the captured men near Tikrit University, and told them they would be returned home unharmed. Instead, the IS fighters stripped the men of their mobile phones and their money, and drove them into what Ali described as a palace compound. There, he said, he was crammed into a shipping container for six hours with over 100 other detainees, two of whom died due to the overcrowding and sweltering heat. Ali said that IS let him and the others out of the container at 5 p.m., broke them into smaller groups, and took each group to a different location. He said he was in a group with nine other men, and heard the sound of gunfire from other execution sites, including the nearby Water Police building. Their Islamic State captors bound his and other prisoners’ hands behind their backs and covered their eyes, then forced them to crouch forward with each man holding the t-shirt of the man in front between his teeth as they marched them to the bank of the Tigris. They then lined up the 10 men and shot them with a pistol, one after another. Ali said that beneath his blindfold he saw the man next to him fall to the ground covered in blood, but that somehow he was not hit, so he fell to the ground and feigned death until nightfall, when he escaped under cover of darkness. 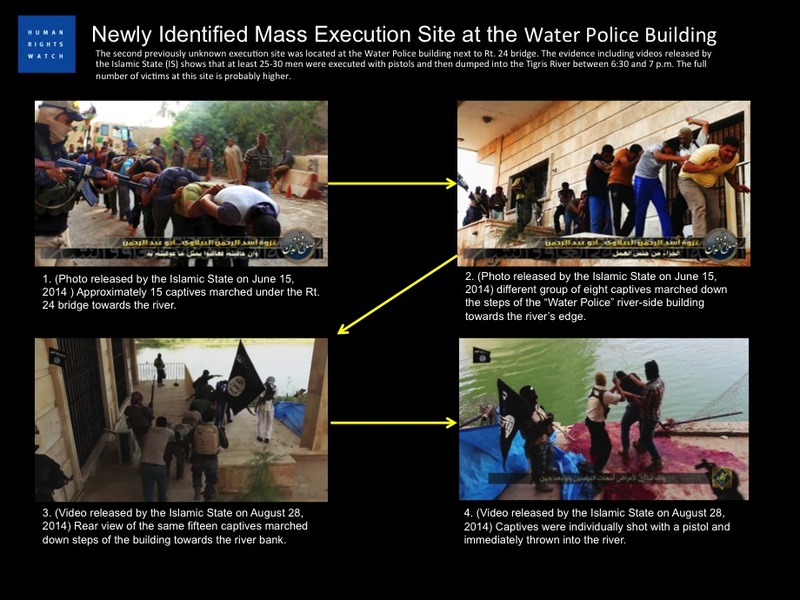 In addition, the new video released by the Islamic State reveals at least two previously unknown rounds of executions at the Water Palace site, with between 115 and 140 deaths. This brings the total number of men that the Islamic State is known to have executed at the site, based on their own video evidence, to between 235 and 285, at least, although the actual total could be much higher. The Islamic State is now known to have carried out at least four separate mass executions at the Water Palace site. The evidence Human Rights Watch examined also appears to confirm the existence of a mass grave at the Water Palace execution site that contains the remains of at least 35-40, and probably between 235 and 285 victims, of IS executions. The video newly released by the Islamic State indicates that IS fighters used a bulldozer to cover the bodies under mounds of earth after each round of execution before unloading the next group of men at the site. In one case, the video shows IS shooting 40 to 45 men as they lay against the mass grave of other prisoners whom IS had shot and covered with earth approximately one hour earlier. In one video sequence the torso of a victim from a previous execution can be seen protruding from the ground. Additional locations, vehicles, and captured men depicted in Islamic State videos suggest the full death toll will continue to climb as new evidence emerges and is analyzed, Human Rights Watch said.